COMBINING WORKS OF MUSIC AND FILM THAT WERE ORIGINALLY INTENDED TO BE SEPARATE MAY SEEM LIKE A STRATEGIC ACT OF POSTMODERN APPROPRIATION OR INTERTEXTUAL ENQUIRY. STEPHEN WHITTINGTON’S THE MUSIC OF LIGHT IS IN FACT A UNIQUE TREATMENT OF THE ART AND PHILOSOPHY OF US FILMMAKER STAN BRAKHAGE (1933–2003) AND OF THE MUSIC OF THE COMPOSERS WHOSE WORK HE PERFORMS WHILE SHOWING BRAKHAGE’S FILMS. ULTIMATELY, WHITTINGTON’S PERFORMANCE IS AN ESSAY ON THE RELATIONSHIP BETWEEN SOUND, LIGHT AND HUMAN PERCEPTION, AN ESSAY THAT IS ITSELF A WORK OF ART. In this 90-minute performance, Adelaide pianist, composer and lecturer Stephen Whittington shows several of Brakhage’s most famous short films, including Dog Star Man Part 2 (1963), Black Ice (1994) and Glaze of Cathexis (1990). Simultaneously, he performs at the piano the music firstly of JS Bach and then Alexander Scriabin, Arnold Schoenberg, Philip Corner, Anton Webern and Josef Matthias Hauer, and he replays a computer-mediated recording he made of keyboard music by Brakhage’s associate James Tenney. Brakhage, initially a poet, was influenced by Bach and studied music to inform his filmmaking and, in the program note, Whittington suggests that Brakhage’s films were visual embodiments of sound. Whittington also performs his own work, Passacaglia B.A.C.H. (2011), which he wrote for this performance, an entrancing piece performed without film accompaniment to allow viewers to focus solely on the music. Stan Brakhage made hundreds of short films, some just a minute or two in length and some using radical techniques such as gluing objects onto the celluloid or scratching or hand colouring it. These were works of visual art more than cinema, often having the effect of an abstract painting unfolding in time. Those films that focused on places and people, for example The Wonder Ring (1955), which shows scenes shot from a train window—the world as perceived by the train—are primarily optical rather than narrative. The rapid succession of abstract shapes asks us to experience our visual awareness rather than read for meaning, and so to consider how we assign meaning to imagery. We’re invited to try to regain our visual naivety or innocence. Brakhage’s film is avant garde in its intent and form, using the medium to analyse visual perception. Each composer also contributed to the dialogue on the essence of music, their avant-gardism lying in the investigation of the inner truth of their chosen art. The Music of Light is not a thorough analysis of Brakhage’s oeuvre, but considers aspects of his work and their relationship to music. Nor does the performance fully consider the oeuvres and impact of the composers. Instead, it is a synthesis of certain aspects of their respective work. This performance recalls some significant milestones in Western artistic development. 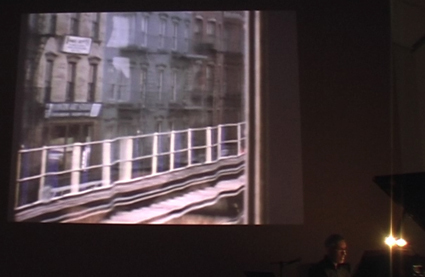 Whittington states that the music was not intended to accompany the film, but that the performance comprised two streams in parallel. But the Brakhage works were intended to be silent and the music was intended to be heard on its own, prompting us to consider how combining them affects both visual and musical experiences. By blending visual, musical and textual discourses into a unique synthesis, Whittington creates an exciting new work that represents the way in which sound can induce visual awareness and vice versa. This cross-mediation of vision, sound and performed text opens each discipline to deeper phenomenological analysis through comparison and demonstrates the coherence between them, amplifying and confirming the nature of human awareness of light and sound and the way they are theorised. The Music of Light is an illuminating and finely crafted performance. The program concludes with Brakhage’s Chinese Series (2003), made by the artist on his deathbed, and is accompanied by Whittington’s arrangement of Bach’s last work, also written on the deathbed, the Chorale Prelude: Before Thy Throne (1750). Whittington completes the parallel by describing the arc of the two artists’ lives, each leaving a final statement that reflected on life, death and God.